Jackson Elementary School developed a schoolyard habitat in the spring of 2006 under the direction of the Jackson PTO and with the help of many community members. The one and a half acre site is located right behind the school. Jackson Elementary School Schoolyard Habitat is a certified National Wildlife Federation Wildlife Habitat. The purpose of the Wildcat Habitat is to provide the four elements that must be present for wildlife to survive: food, water, cover, and a place to raise young. 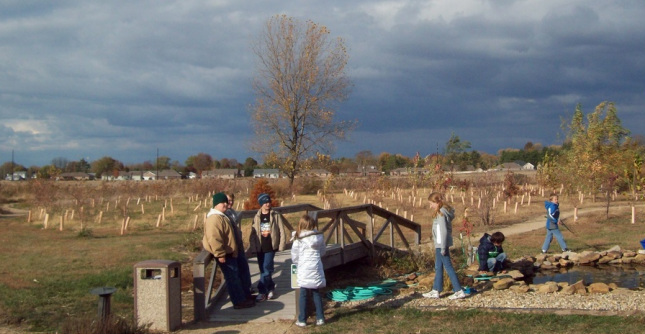 This outdoor lab also serves as an outdoor learning resource to enhance the teaching of science, math, langage arts and social studies standards. Even though the habitat is located behind Jackson School, the whole community is always welcome to visit the habitat to watch, learn about, and explore the native species that have chosen to live here. This native garden is shaped like the state of Indiana. 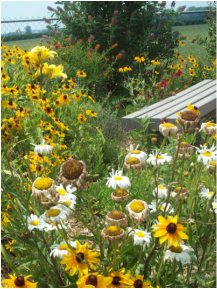 Children can walk through the path and see native plants like autumn sneezeweed, purple coneflower, monarda fistulosa, butterflyweed, rudbeckia, little blue stem grasses, false indigo, liatris spicata, spiderwort, and asters. In the center of the 'state' stands the state tree, the tulip poplar. In the place where our city of Seymour stands in the state flower, the peony. This early spring photo shows some of last years plants that were left for birds to feed on the seedheads during the winter. This tool shed has necessary tools for the children to work and learn in the habitat. The bridge was constructed over the pond overflow. It makes a bog area that flows into the natural drainage of the land. The pond not only provides the necessary water for the area wildlife, it is home to many animals including this bullfrog that was found in the pond filter. The children also find dragonfly nymphs, small minnows, snails, water striders, frog and toad tadpoles and an occasional garter snake. The pond is a great way to teach the life cycle of dragonflies and frogs without bringing animals in the classroom where they might not survive. The gentle sound of the waterfall provides great background music that encourages a wonderful writing and reading setting. Flowers in the butterfly garden include common milkweed, lavender, butterfly bush, dill, blanket flower day lily, shasta daisy, violets, black-eyed Susans, butterfly weed, and monarda. These plants provide both larva food and adult nectar. 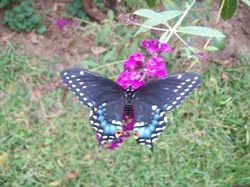 This red-spotted purple is one of the many species that visit the butterfly garden. Many days monarchs, skippers, buckeyes, black swallowtails, tiger swallowtails, painted ladies, and fritts may be observed. The students have planted more than 500 trees in the habitat, including 20 different native species. In the background of this photo you may notice orange covers around these 5 year old trees. Since the rabbits love to nibble on the tree bark in the winter, the protectors were added to save the trees from being rabbit food..
Bird houses were built by the student council members as one of their projects and placed throughout the prairie area.Tree swallows can be seen here in early spring preparing their nests in the houses. During the summer months the swallows may be seen swooping over the pond, skimming the surface for insects and water. Many species of birds visit the habitat including mourning doves, Cooper's hawks, robins, cardinals, house finch, red-winged blackbirds, and killdeer. The children love to discover killdeer nests in the rocks around the pond in late spring. Then the tiny killdeer chicks may be seen skittering through the grasses until they are strong enough to fly. The prairie, which is seen in this photo, was planted with many native wildflowers. In the summer you can see compass plant, cup flower, asters, liatris, wild bergamot, purple coneflower, rattlesnake master, buttonbush, butterfly weed, swamp milkweed, sneezeweed, and many sedges in full bloom. Thanks to our Community Day of Caring 2010, these raised beds were constructed. The children planted pumpkins, peanuts, popcorn, and sunflowers in the beds after they were built. The following fall the produce was ready to be taken back into the classrooms to be eaten. The children discovered how these foods were grown and harvested. Many birds enjoyed the sunflowers as they became growing birdfeeders.